Riccardo showed it perfectly. He also had no experience in the top team and totally destroyed Vettel. From the first to the last race. Charles, I do not think he'll be worse than Daniel. lol.....if seb's gonna be destroyed by Charles next season....man on man, Seb's gonna have the most miserable TWO years at ferrari.....or is just one more year for him in his contract??? I don’t think Seb will be ‘destroyed’. The car is good & Seb we all know can extract good pace from it. RedBull 2014 was a tough car and some talents like Dani, Alonso & Hamilton have ability to extract more from a poor car. Having said all this, I do not think Charles is here to move over or win if Vettel has issues, he in my strong opinion is here to win championships. I do not think Charles is here to move over or win if Vettel has issues, he in my strong opinion is here to win championships. Seb is Ferrari's #1 for 2019. Eventually and in time, Cbarles will be their #1. Last edited by jgonzalesm6; 21st September 2018 at 12:48. Charles 2019 @ Ferrari will surely due what he can for WCC. As far as him doing his best and all he can for a WDC , it will be up to how the team appoints him as far as #1,#2 driver. I only hope the first few races they both are equal which will give Charles his chance to show what he has. I didn't say he isn't beatable, I just see team orders in effect. Just like Kimi had to give way in Germany. Yet they let Kimi stay ahead in Austria? Kimi was on a different strategy in Germany not really a team order as such. Seb wants to win a wdc especially after this year and especially if he loses it the way this goes down. So yes the way this goes Leclerc as a new driver is going to be asked to be a support driver and not push Seb but be a new Reubens. He might win but that will happen when Seb will be safe with WDC. Seb is what Ferrari choses him to be just like every other driver before him. And at the moment he is the face of Ferrari in F1. Ferrari chose the German to beat Lewis just as they would any other top driver they had before him. What is the current face of Ferrari waiting for? Dan had to take a hike because of his team mate being allowed to and did out race him and IMO except for the car vs. Merc, Ferrari he would be Lewis' worst enemy. Possibly; he already is! Surly depends on the outcome of this year. If he fails to win the championship his stock might be lower and it is up to Charles to make an impression and prove he isn’t a number 2. Kimi Raikkonen may not be a Sauber man yet but already the team is feeling the effects of his upcoming return. Sauber announced earlier this month that Raikkonen would be joining the team next season having signed a two-year race deal. The Finn, who made his F1 debut with Sauber back in 2001, is already have a positive impact on the team. “He has the reputation to be a very good technician, with very strong feedback,” Sauber F1 team principal Fred Vasseur told Motorsport.com. “Probably when you are 450 people it’s more important to have this kind of guy than when you are two or three times bigger. Vasseur believes Raikkonen’s soon-to-be-return has galvanized all the people working for Sauber. “The reaction in the factory was huge. “It’s a huge push to consider that someone like Kimi could join the project, that he trusts the team, he trusts everybody in the team. However, it is not just in the factory where it is being felt. Sauber, backed by Alfa Romeo, is also seeing a lot of interest from sponsors who want to be associated with the Raikkonen name. “The announcement of Kimi was a huge push also in terms of marketing. “I think we will discover the impact of Kimi’s situation week after week. On the grid he’ll be with one of the three world champions next year, with Seb and Lewis, and he has a huge impact. “Kimi was a bit unexpected 12 months ago, but 12 months ago we were absolutely nowhere. Cool. Fun times and great times for Kimi and the Alfa-Sauber team! haha why would they tell Charles not to push him? LOL does not matter what Seb wants, he is not Ferrari??? or is he bigger than the team now in your mind? I believe the signing of Leclerc signals the end of Ferrari's one-eyed support of Vettel. Vettel has failed to maximize points this year and if he doesn't win the WDC....I doubt he will get the same levels of support from within Ferrari as he does now. That might be the case, but can really Leclerc challenge him? We forget sometimes how fast Seb is and how challenging it is at the top. Nobody would pay tens of millions a year for a driver, if the data and telemetry doesn't show he is faster than the others. You only have to look at the salary they're paying him. And since you ask me, no , I don't believe he's bigger than the team. And if he cannot deliver, he should see the door just like others before him. But right now, this is what it will happen in my opinion. Of course if it does not it will be a pleasant surprise. I also hope we see Charles pushing Vettel to the limits. And who knows, we might even see Charles performing better than Seb and Seb being a wingman to him. So GIO and RAI for 2018.....Ericsson will be reserve driver. Nice. GIO in his early days. His family has future aspirations? I'm really happy about GIO getting the seat beside Kimi and to have an Italian driver with a Ferrari engine back on the grid. I feel sorry for ERI, though, he has been improving this season, probably the Charles effect was helping him! He will still be with the team but I hope GIO can deliver the goods. I actually think Ericsson is underrated and no worse than Stroll or Sirotikin. A lot of people were going on about Kobayashi and Ericsson outperformed him at Caterham. What a great opportunity for Gio to get the F1 seat alongside Kimi who for sure will do right by him. Not starting in a top car will give him plenty of mid track experience and mix it up with top to bottom drivers. When Gio gets the "Blessing" of a Ferrari seat , he will be ready to give himself and the team 100 % !! BTW only a fool of a fan will even think of Gio trying to out perform Kimi esp. 1st yr. 1st. seat. Just watching him progress will be exciting. 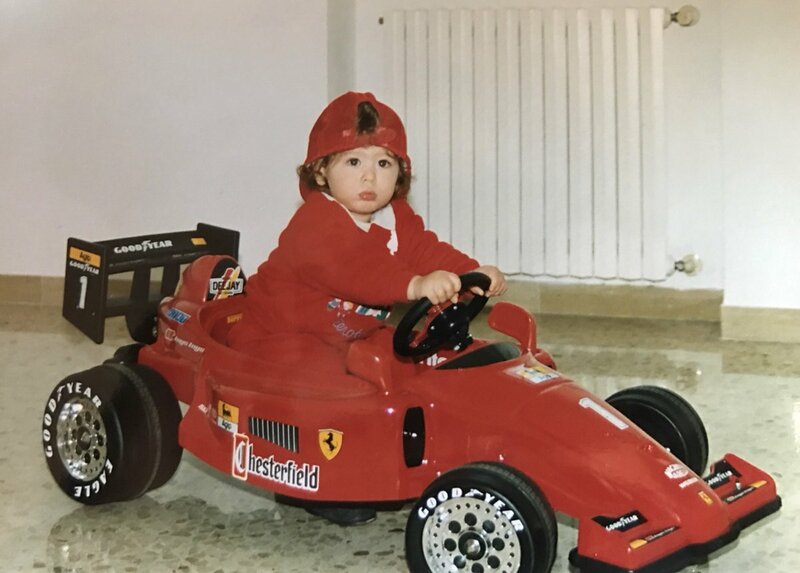 Meanwhile Leclerc up top @ Ferrari, I hope will race every race to win. Last edited by Brembo; 26th September 2018 at 10:32.